The notoriety of Libuscha's vast herds of Libuscha's predatory Banksia is such that people often assume that in the skies above the Banksia Plains are relatively safe - after all, the Banksia themselves are slow moving beast, rarely reaching heights beyond 6 meters tall and even the local tsunami's top out well below the operational ceiling of all but the most antiquated vehicles. If it were the case, Libuscha could almost be termed a paradise. Unfortunately, like Libuscha's Banksia Plains, the skies of Libuscha are also teaming with life that both resilient relentlessly aggressive. One such life-form is the Libuschan Sky Urchin. Sky Urchins are spiny, globular animals that, with their close kin, such as sky mites, constitute the class Echinoidea of the echinoderm phylum. About 950 species of echinoids inhabit all Libuschan skies up to the stratosphere. The shell, or "test", of sky urchins is round and spiny, typically from 1 to 2 meters across and surrounds an internal gas bladder that provides the urchin with its buoyancy. Common colors include green, olive, brown, purple, blue, and red. Much like their land-bound cousins the Banksia, Sky Urchins are aggressive omnivores. Sensitive to movement, they'll plummet from hundreds of meters out of the sky, impaling their prey on their spines before rising up to feed into the sanctuary of the sky. Urchins don't restrict to themselves to terrestrial targets either. Draw as they are to movement, should they sense an aircraft they'll commencing trailing the same. This can result in hundreds or even thousands of urchins converging in on the hapless vehicle, clogging intakes and overwhelming control systems. Worse still, even should the vehicle evade the urchins, they can unwittingly lead a ravenous horde of urchins back to their port which can quickly overwhelm all but the most sophisticated of defensive systems. Sky Urchins are treated as dangerous terrain that may be employed by a Player as a Counter Action to any of their opponent's movement-based Action (Move, Charge etc). When doing so, a Rogue Die is included in their opponent's Skill Check. The Rogue Die result, should it match one or both of the results on the two Skill Die, that die or dice is discounted. Should the Skill Check result in a Failure, then apply the Rogue Die as damage to the target. 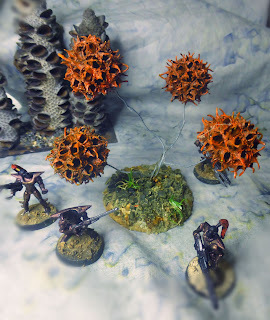 In the event of a Critical Failure, then also effect a Sky Urchin attack on each and every unit (CQ5 +1 vs Small) on the board, representing a swarm of urchins descending upon the battlefield.